What a surprise the 14th April 1999 turned out to be. The forecast that morning had the outside chance of a weak thundery shower with the passage of cold front along the New South Wales coast. After looking at the surface chart I must confess that in my mind this was even optimistic. Therefore I did bother charging video batteries, or making sure the camera was close at hand and most important making sure that transport was available. At 4pm I had noticed that some very weak convection had occurred to the west and had drifted over the coast and was giving some light showers in the southern Illawarra, nothing to get excited about, no thunder, no boiling updrafts - so I went back inside and started working again. I finished work at 5pm and drove home, on my way the dark cloud bases had taken my interest. There was large rain free congestus that appeared to developing with the SE wind change independent and separate to the earlier stuff. I was in two minds, on one hand it looked weak, on the other I was impressed by the darkness of the rain free base ( should have been a wake up call that perhaps the updraft was already strong ). When I got home I noticed that the top of the one cell immediately to my south was glaciating and I observed a small CC lightning. Still not overly impressed I went inside and fired the PC up for some afterwork relaxation. Five minutes later and a cannon blast thunder clap snapped me to attention. I rushed outside and looked to the south and it was black, very black. I immediately ran for the camera.........oh no, I had left it at work....OK, what about the video.....mmmmm!...in with one battery, flicked the switch..dead,..... dug out another battery and life ! !, but I knew it may only last seconds. I got into the car and drove it to the top of the street, a high hill with large trees. 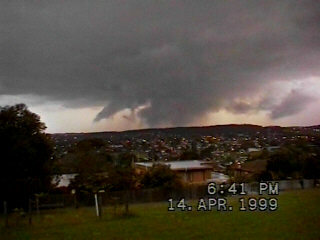 I was stunned to see a severe storm in progress over Shellharbour, there were some very suspicious lowerings, and the taint of lifted dust. I ran to a small clearing and started the video. Now the top of large hill complete with pine trees is not a wise place to be when CG's are about. I soon discovered this as three very close strikes finally had me back into the car. No sooner than I had got in the car and another strike closeby, this time an audible ' pzzzssstt ' type noise came from the video camera at the exact time of the strike, followed a split second later by the thunder clap. Rain started to fall and my view of the storm disappeared. I decided to retrieve my camera from work, just 5 minutes down the road. When I got there the cleaner said hail had fallen at her house, and indicated golfball size. By now the sun had just set and the storm had moved just offshore and was turning on a lightshow. I stopped at Warilla beach to get some lightning pics, in the grass I found some melted hail about the size of thumbnails, but disk shaped, which had me thinking that they were once much larger. Low level cloud with the SE wind was spoiling the lightning show, although the storm's updraft was very clear. It was boiling quite actively and backbuilding constantly. On my way home I heard a radio report about golfball sized hail in Shellharbour. I logged into the PC and looked at the storm on radar, it was small, but contained a large area of solid red reflect - a sign that hail is probably occurring, it was now located 1-2km off the coast, just north of Wollongong. I animated the last few frames and saw that the storm was moving N/NE. This along with the backbuilding I had observed led me realise that the storm would probably impinge back over land, especially as the coastline between Wollongong and Sydney swings more NE too. I rang the Bureau of Meteorology and reported the storm, and suggested that it was severe and may move over land again. By now it was about 6.15-6.30pm. The events from this point on are probably better summed up in Michael Bath's and Matt Smith reports. These pages contain some great photos and radar images. The storm kept it's N/NE track and the rear moved back over land just south of Sydney, it maintained a solid red reflect all the way up the coast. At this point ( 7.25pm ) I posted the Australian Weather newsgroup with message this message..
"Have been watching the rear of this storm as its moves up the coast from the Illawarra, it has been sending some lovely rear updrafts in the last 30 minutes or so ( active lightning is letting me see it ). It looks like the rear is back over land again north of Stanwell Park. I would not surprised if Cronulla gets a beating shortly. Like I said this has nasty written on it. Another very small cell has just developed east of me, but over ocean. The storms path of destruction did indeed start in the Cronulla area and moved northwards over the next hour through the eastern suburbs of Sydney. Hail the size of tennis and cricketballs fell across a large area severely damaging thousands of homes and cars. 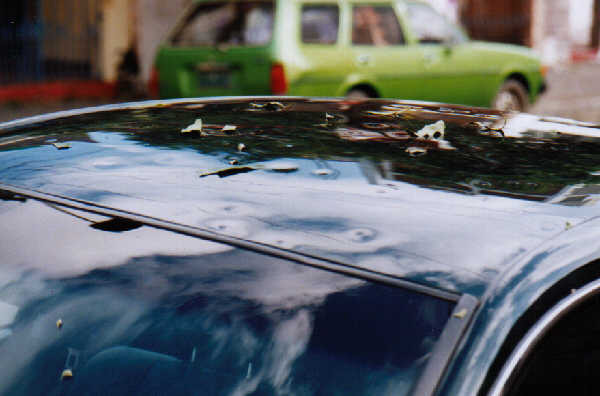 The hail smashed through tile roofs, then in some cases through the ceiling and into peoples living rooms, kitchens and bedrooms. 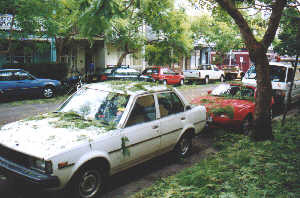 The Sydney Hailstorm is probably the first event that I have ever seen the media underestimate, the next day and $300 million in damages was the average newspaper headline, damage estimates are now around $1 Billion, it may even become Australia's second most costly natural disaster after the Newcastle earthquake and higher than Tropical Cyclone Tracey. 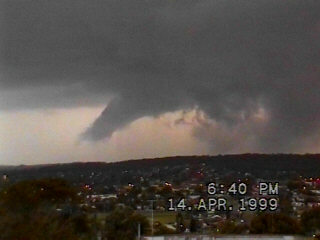 The next day I had to work in Sydney. 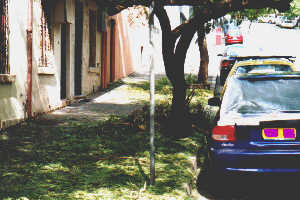 The area of damage is what struck me, for several suburbs in Sydney's south and east there was hail damaged cars and homes. 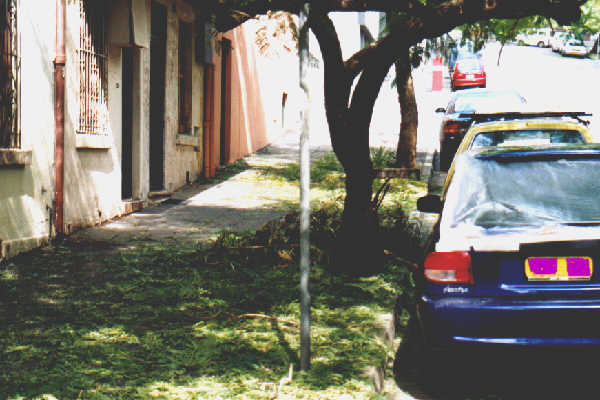 The amount of tree defoliation was also another surprise. I took a few photos during my lunchtime, unfortunately I did not have the time to visit the worst affected areas.